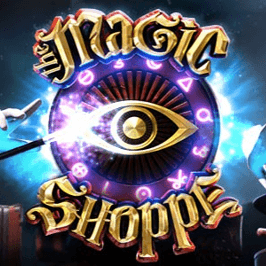 Welcome to the Magic Shoppe online slot machine, the latest title from the creative minds at Betsoft. This is a place packed to the rafters with sorcery and suspense, although there’s no mystery to the fact that there are some fantastic cash prizes up for grabs. Upon this enchanted gameboard lie 25 paylines and an eclectic selection of features and bonuses, ranging from a free spins round to the lucrative magic wand game – it’s here where the big prizes lurk. 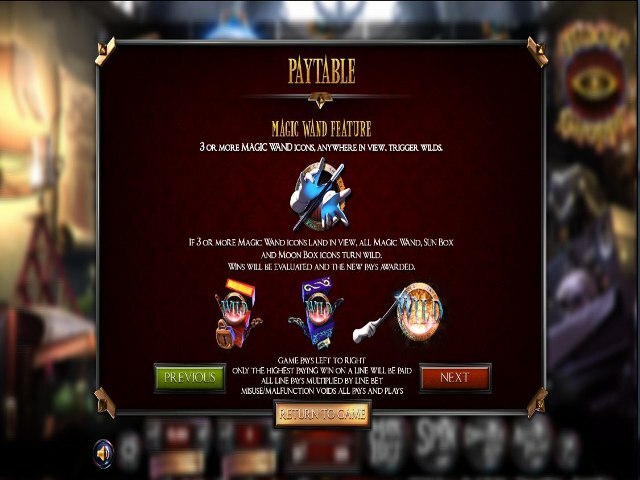 With a jackpot pay-out of more than 500,000 coins available, you’ll certainly be a believer in magic if you can make this entertaining slot game pay out. Play Magic Shoppe Slot Demo for Free! Play Magic Shoppe for Real Money! 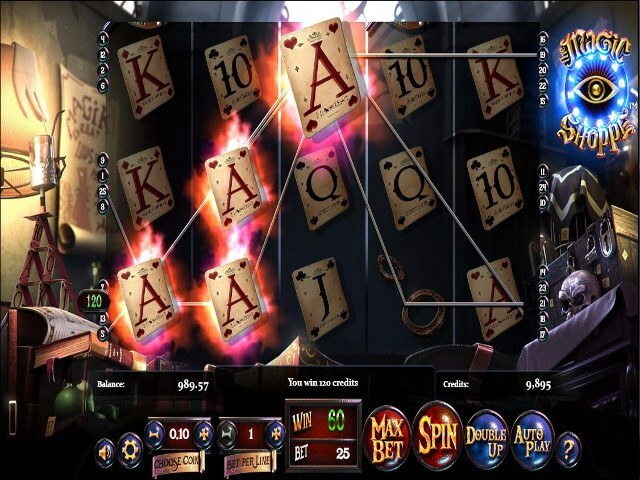 Any review of the Magic Shoppe online slot must make mention of the graphics and soundtrack, which while basic do add a sense of anticipation to proceedings. Landing two of the magic wand symbol on the first three or four reels – and then watching on the edge of your seat as the last reel slows and the music reaches a crescendo – really does add to the magic, if you’ll pardon the pun. 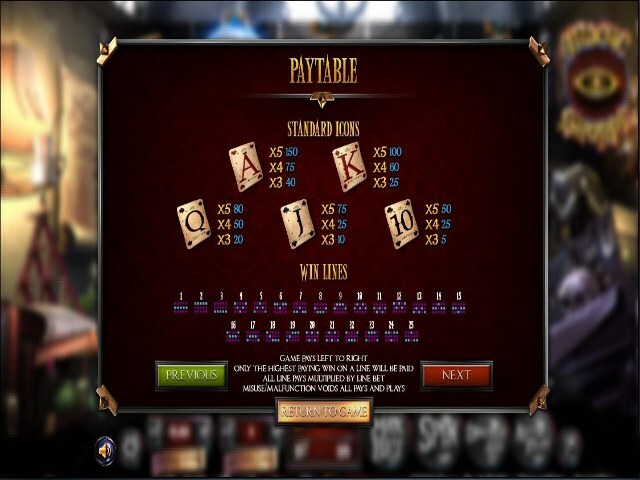 The Magic Shoppe online slot machine is traditional action that ticks all the right boxes. Players can modify their wagers based on coin size and bet per line modifiers, so you don’t need to be a high-roller to enjoy this slot title. The base game plays out in a standard fashion, and it’s the free spins round and bonuses where the feelings of anticipation really ramp up a notch or two – more on those later. A nice touch is the ‘Double Up’ game, which allows players the opportunity to bet half or all of their winnings on a toss of a coin in an all-or-nothing twist. 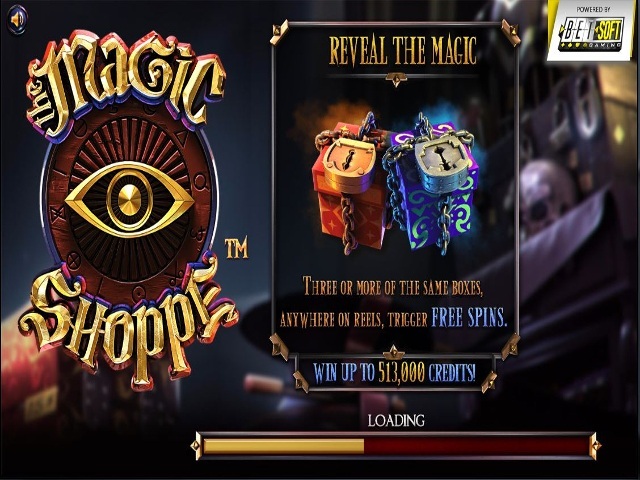 The object of the main game in the Magic Shoppe online slot is to reveal three or more of a matching symbol on a payline for a win – preferably one of the higher-paying icons like the crystal skull or handcuffs. There is a wild character that pays out handsome rewards by substituting for all other symbols, but it’s the special avatars that hold the key to the eye-popping prizes. The first is the magic wand, which when three or more appear on your reels transform all ‘specials’ (including the magic wand and sun and moon boxes) into wilds. This can create some exciting new wins. The sun and moon boxes are, as their name suggests, padlocked trunks with an orange (sun) and blue (moon) glow. These are the trigger for the free spins feature, with three or more anywhere on your reels doing the business. Three awards a trio of free spins, six boxes hands out a half-dozen, while a full set of five rewards players with a dozen free spins of the reels. Here’s where there’s plenty of love from players – every free spin is guaranteed to award a prize. It could be a payline win or an additional feature added to the reels. Plus, free spins can be re-triggered while playing the bonus feature. Now that’s what many would call magical! Share this Magic Shoppe Review today! If you like Magic Shoppe, you'll love these slot titles too!